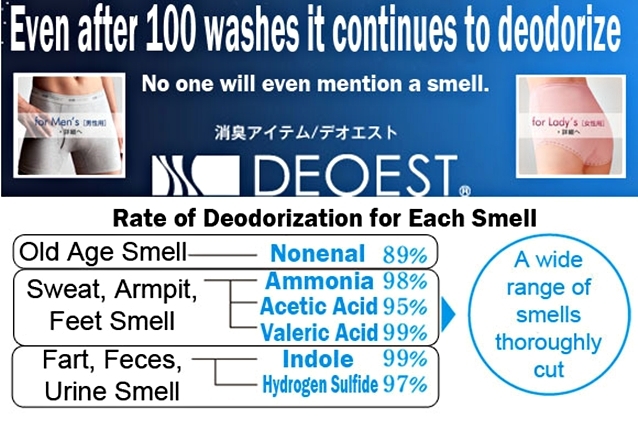 Thanks to Japan’s new invention, the Deoest underwear, extreme farters can now release their foul smelling gas and prevent people near them from fainting. It is a fart-deodorizing underwear, created by Professor Hiroki Ohge of Hiroshima University. He got the inspiration when he visited America to study how illnesses could affect the smell of people’s flatulence. He was able to reach the conclusion that by analyzing the smell of gas and its main component, hydrogen sulfide, one could tell if a patient is suffering from a disease without having to go through complicated examinations. He also identified some flaws in several fart deodorizing products that that make use of activated carbon and charcoal. Ohge developed his own underwear, that is made of a ceramic material. He found its tiny pores effective in neutralizing the intoxicating smell of fart. His invention can withstand all kinds of bad smells like gas and sweat. He first introduced it to elderlies who stayed in Nursing homes and found the product to be effective. Japanese company, Inodore, showed interest in Ohge’s invention and has used ceramic fabric to develop different kinds of underwear to cure people from body odors and block the smell of fart.